SkirtsAfire Festival is rooted in passion for and celebration of art and community. Join the heat wave! Donate. 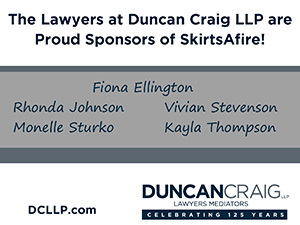 SkirtsAfire is a registered charity and non-profit organization. Private donations and corporate sponsorships go an incredibly long way in ensuring we can provide our guests with the best possible artistic experiences, and support our artists with fair wages and quality performance opportunities. Every little bit helps! Work for us. If you are a student, you are eligible to apply for our SCIP Internships. Roles vary in skill-sets and scheduling. Join a fun, friendly, and fast-paced team by applying now! Read more about our employment opportunities here. Design. As we head into our sixth year, we are looking for six designers to compete in our Skirt Design Competition by designing a Skirt made of found and up-cycled materials, in the theme: A Skirt From Abroad. The top six submissions will be presented in a runway style display at the festival Media Launch, where the winning Skirt will be crowned as our Official Festival Skirt. Find the guidelines and application here. Submit your play. SkirtsAfire along with Alberta Playwrights’ Network are now accepting submissions for the sixth annual Peep Show!, a tease of new plays to be presented at SkirtsAfire Festival, taking place March 8-11, 2018 in Edmonton. Read the submission criteria and guidelines here. Volunteer. The success of our festival depends on our incredible volunteers. Become a part of an energetic team dedicated to elevating and celebration the work of women. Become a Board Member. Looking to help make a difference in increasing the number of women in the arts? Consider joining the Board of Directors of SkirtsAfire herArts Festival! Stay in Touch. We’d love the opportunity to share upcoming events and news with you, and are always happy to hear how we’re doing. Please join our mailing list so we can stay in touch!